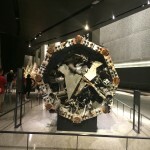 Earlier this month, a friend and I set out to visit the 9/11 Memorial Museum. I had researched ticket availability ahead of time and learned about the free tickets available after 4:00 p.m. on Tuesdays. As you can imagine, we saw huge lines and were easily deterred. My friend mentioned she wasn’t sure she was ready to revisit her experience yet; having mixed feelings myself, I didn’t press the issue and we left. There was a line for timed ticket holders to get in, but it moved quickly. Once inside, the crowd was heading downstairs to the exhibition areas, and I followed along to the Foundation Hall. Seen from above, the first sight on the left is the “slurry wall,” a retaining structure from the original World Trade Center. 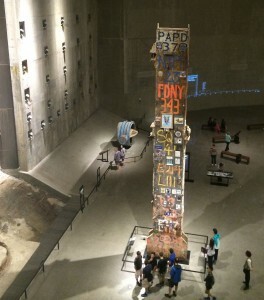 In the center of the Hall, the colorful Last Column dominates, heavily decorated by rescue workers, first responders, volunteers, and family members of the victims. Despite the large number of visitors, the Hall’s 110,000 square feet feel spacious and hushed—reminiscent of a Cathedral. A description of shimmering lights around the towers, which turned out to be shards of glass from the Tower’s windows, suspended in the high winds, read like my own. An account of the thousands of memos flying high above in the air like confetti tied in with a visual memory I have of walking to work on Water Street that day. 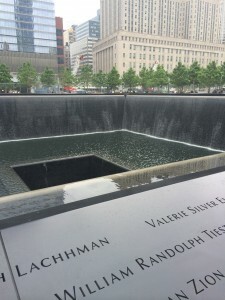 By the time I got to the third part, “After 9/11,” claustrophobia was setting in and I was relieved to step back into the expanse of the Foundation Hall. 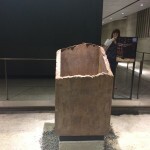 The museum has been criticized for ritualizing grief, charging admission and for having a gift shop. 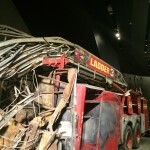 Nevertheless, the 9/11 Museum is a thorough, important tribute to the many courageous stories of the day. While it’s heartbreaking to see the shoes of a photojournalist who died documenting the horrors of the day, or the red bandanna of a finance worker who relentlessly shepherded people to safety until he too perished, it would have been worse to not preserve the stories about what happened. I didn’t spend as much time there as I might have, but I’m allowing myself the option to return to both the Memorial grounds and the Museum whenever the need arises. Note: Photography is not allowed in the Historical section of the museum, but this interactive New York Times piece includes photographs and videos.